In late November to mid December 1962, Murry Wilson traveled to Europe for a trip combining promotional efforts on behalf of the Beach Boys and personal medical reasons. On Wednesday, November 21, 1962, the day before Thanksgiving, Murry completed Department of State Form DSP-17, Passport Renewal Application, at the Los Angeles Passport Agency on Wilshire Boulevard. Two days later, at 3:00 p.m., he paid five dollars and picked up his renewed passport in person. 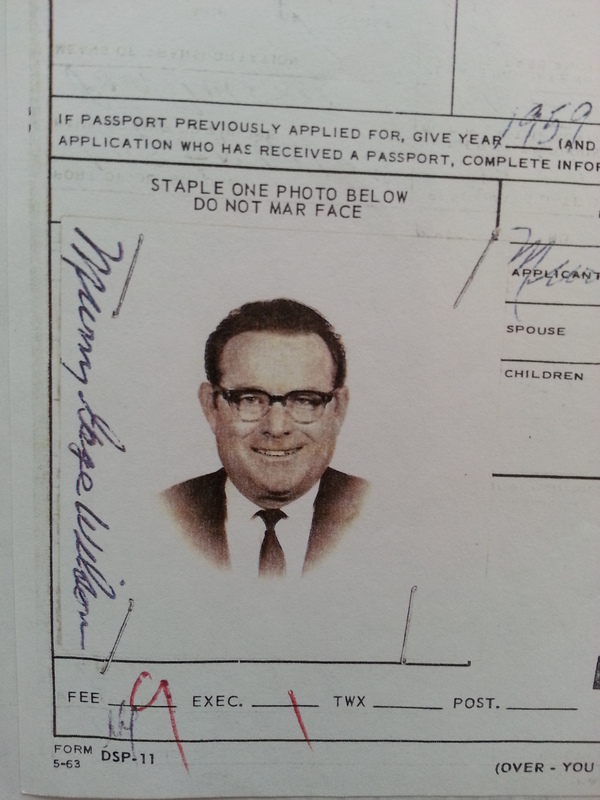 Murry Wilson passport photo. Murry’s passport application to travel abroad to Sweden, in part, was signed November 21, 1962. Murry had to renew his passport because the last time he had used a passport was for a business trip to England and France (Paris) from September 4 through September 19, 1959. He was under a tight deadline now as he stated on his application he planned to depart LA November 28 aboard Scandinavian Airlines to Denmark. He indicated over the next seventeen days he would travel to West Germany, where the stated purpose of his visit was for medical reasons, Switzerland, and England. It is unclear what medical reasons took Murry to West Germany or how many days he spent there. On Monday, December 3, Murry wrote Dorinda and Hite Morgan on stationery from the Grand Hotel in Stockholm. I transcribed the letter as written and spelling errors have not been corrected. Dear Dorinda, + U too, Hite! Arrived here this AM to find snow + 26° after 2 days of 32° in Copenhagen. Got here just in time to get on the dj Kläs Burling Pop-62 R + R Programe for a nice interview which will help the Beach Boys next releases. Hite this 21 yr. old Swede was so nice he taped our talk, + then he gave me a dupe of same which I will bring home w/me. Then I rushed to the Hotel Grand + listened to myself on: XA! Svedish Radio. By the way I went to two large stores + I found that the Falcons did; A “Swingin Safari” + NOT “Surfin’ Safari” + I bought a disc to prove it. You should have seen me going thru these large dept stores w/all these suitcase bags in all the Xmas shoppers. It was a chore + I am still tired 8 hours later. I find out that Capitol has a 4-tune 45 RPM 8” Disc of Surfin Safari + 3 other B. Boy tunes + I bot (sic) 6 of them too! Stockholm is a very lovely “olde” city + the people are nice, but the Danish people were even nicer and more happy! I leave for London tomorrow at 6 a.m. + 3 or 4 days there, + then onto Germany + then maybe Luxumburg (sic) or Amsterdam to plug the #4777 Disc. Luxumborg radio is very powerfull in Europe + every one hears it + they sell R+R of all countries. You should hear some of the strong European R+R played in Denmark + Sweden + Luxumborg. It is interesting to note in December 1962 Murry was still on friendly terms with the Morgans. Their relationship soon turned acrimonious, but as the band’s first six months on Capitol drew to a close Murry reveled in sharing his promotional efforts with the Morgans.A few other things can be gleaned from Murry’s letter.First, he did not adhere to the itinerary he outlined on his passport application. It is unclear whether he actually traveled to Switzerland. Second, if he arrived in Stockholm December 3 after being in Copenhagen for two days, he may have departed LA sometime after November 28. Alternately, he may have stayed in Copenhagen more than two days, but only the last two saw temperatures of thirty-two degrees. It would seem unusual, however, for Murry to spend four days (November 29 to December 2) in Copenhagen, but only one day in Stockholm. Third, Murry, and perhaps Hite, apparently thought the Falcons had covered “Surfin’ Safari” and Murry’s interest in seeking out the Falcons’ record arose from protecting Brian’s and Mike’s financial interest in the songwriter royalty and Hite’s interest in the music publishing. Fourth, Murry was intent on promoting Capitol 4777, which was “Surfin’ Safari” backed with “409.” Both songs were off the charts in the States and the follow-up single, “Ten Little Indians” (b/w “County Fair,” Capitol 4880), had been released November 26. However, “Surfin’ Safari” was still popular in Europe and fueling sales of several EPs in several European countries. Finally, it is unclear whether Murry visited Luxembourg or Amsterdam, Netherlands, or perhaps both countries. The powerful Radio Luxembourg would have provided an important marketing opportunity for the Beach Boys. I have been unable to find an audio file or transcription of Murry’s interview with Klas Burling on Sveriges Radio or any interview he may have done for Radio Luxembourg. As Murry indicated in his letter, Burling provided him with a dub of the interview. It is possible that dub was among Murry’s personal possessions when he passed away in June 1973 and part of his estate inherited by Audree Wilson which, upon her passing in 1997, she bequeathed to Carl Wilson’s son, Justyn. Perhaps one day Audree’s collection will be made available for study by writers and historians dedicated to preserving the Beach Boys musical history and legacy. Capitol Records placed a half-page advertisement in the December 29, 1962, Cash Box in which Murry and the Beach Boys thanked everyone in the music industry for their success in 1962. A year later, Murry again thanked everyone, specifically thanking Klaus Burling, Radio Sveriges, and Radio Luxembourg. A note of appreciation to Brad Elliott, author of Surf’s Up! The Beach Boys on Record, 1961-1981, for the December 3, 1962, letter from Murry Wilson to Dorinda and Hite Morgan. The Feature photo is Stockholm and shows the Grand Hotel framed in the distance between the Christmas tree and the yacht. Murry’s writing the Morgans in December 1962, six months after the Beach Boys signed with Capitol, is enough to convince me that Hite did not say “rots of ruck” to Murry. Your hopes that Audree’s collection will someday be made available for study hit home for me as I’m a librarian. I hope her collection is intact. It occurs to me that El Camino College’s Music Library would be an appropriate place for the collection to be offered.